WILL THEY EVER ESCAPE THE WORKHOUSE? LIFE HAS ALWAYS BEEN TOUGH FOR MAY AND GUS LAVENDER. THEIR FATHER WENT AWAY TO SEA, NEVER TO RETURN, AND NOW THEIR MOTHER HAS FALLEN VICTIM TO THE TYPHUS SWEEPING THROUGH LIVERPOOL. 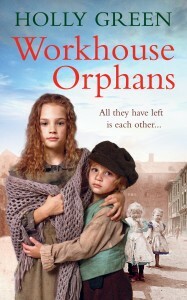 REGARDED AS ORPHANS BY THE AUTHORITIES, THE SIBLINGS ARE SENT TO THE BROWNLOW HILL WORKHOUSE. LIKE ALL WORKHOUSES, BROWNLOW HILL IS THE LAST RESORT OF THE POOR AND DESTITUTE. SO MAY AND GUS WILL HAVE TO RELY ON EACH OTHER MORE THAN EVER IF THEY ARE TO SURVIVE THE HARDSHIPS TO COME. The man led them down a narrow alley and up a flight of steps to a door, on which he knocked. The man left and the one he had called ‘governor’ opened a big book and picked up a pen. Two people entered, a woman in a black dress with a white cap and apron and a man in a grey suit. The governor looked up. ‘And you come with me, boy,’ the man said. Gus looked at him and shrank back, grabbing May’s hand. ‘No! No! I don’t want to,’ he wept, but the man stooped down and picked him up. The lives of the two children, and their friends, manage to reflect the roles of the poor in Victorian England abused, used, discarded and reliant on luck and friendship to see them through. Having said that, this isn’tt a bleak book. May and Gus are likeable characters, and manage to navigate their way through the many dangers they meet. The characters are well-drawn, including the minor ones, and the places, not just Liverpool, but all over the world , are are vividly drawn. I knew nothing about Liverpool before reading this and now I want to visit. Brilliant book from start to finish really hard to put down. This is a new author for me and wow what a writer, could not put this book Down, already pre ordered next book.